TULSA, Okla. — Party lines once again cannot agree, this time putting Native American healthcare in the crossfire. Democrats blocked an amendment to the H.R. 268, or the Supplemental Appropriations Act, which would have funded Indian Health Services for a full fiscal year. “It’s a disaster right now,” said Buel Anglen with Cherokee National Tribal Council. For IHS, it has become a dire situation. IHS employees are now working for the third week unpaid because of the government shutdown. Anglen said cutting funds to IHS is putting people’s lives at risk. 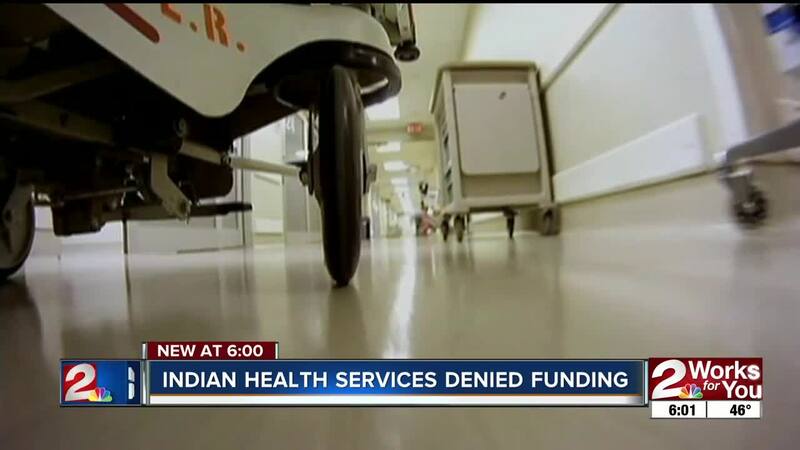 Without government funding, native hospitals have a gloomy future. They'll either be forced to furlough or lay-off staff. At Claremore Indian Hospital, both have become reality. Republican Congressman Markwayne Mullin introduced the Pay Our Doctor’s Act, which would have funded IHS for the 2019 fiscal year. It would ensure that both tribally-run hospitals and Urban Indian Clinics receive the funding they need to pay their doctors and keep their doors open. The amendment was defeated by Democrats with an 8-4 vote. The affects of the committee vote puts stress on not only IHS employees, but patients. “People will see medical services… if it’s a life or death situation, they’ll still be referred on for care but we have no assurance that’s going to be paid or how that will be paid,” said Cara Cowans Watts, former chair of Claremore Indian Hospital Tribal Advisory Board. This means medical bankruptcy for some. Also, a limitation of services for patients will also result if the shutdown continues. “You have trained individuals that may or may not have the financial ability personally to sustain not having a paycheck,” Cowans Watts said. Skilled physicians not being paid may find jobs elsewhere, meaning patients who rely on IHS lose their doctors. Meanwhile, legislators urge lawmakers to come up with a solution and end the shutdown.